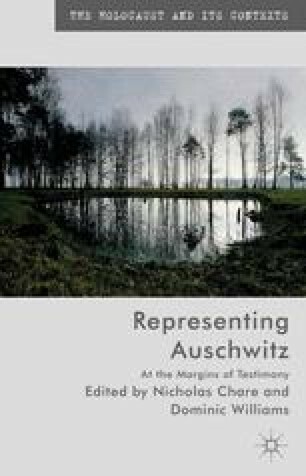 The Holocaust is frequently described in bounded terms. It is defined as an event possessing distinct existential, geographical and temporal borders. This explains why the barbed wire fences erected around concentration and extermination camps, fences that formed their physical boundary, have become a powerful trope for expressing boundaries of knowledge and understanding. The fence stands as a metaphor for limits to comprehension. Griselda Pollock adroitly illustrates the unbridgeable divide the fence has come to represent through her analysis of Margaret Bourke White’s photograph of ‘Survivors at Buchenwald, April 1945’. Pollock writes: ‘while they look at us, the spectators, the concentrationees are divided from us by a barbed wire fence that cuts horizontally across their vertically striped garb as a barely visible barrier that is, none the less, an absolute division. What these men have seen and what they will never cease to carry as images burned into hunger and pain-dulled minds, our sight of them from this side of that frontier cannot imagine’ (2007, p. 276). In this reading, the wire marks a limit point beyond which the minds of those not interned in the camps cannot journey in the sense that they cannot adequately conceive of the experiences endured by the inmates. Babus, A., et al. (2009) ‘O Poet Live in Purity Now’, Exhibition of the Library of the Hungarian Academy of Sciences, 5 May–5 June 2009 [online version] Available at: <http://www.radnoti.mtak.hu/index-en.htm> [Accessed 3 December 2012].